I applied for a Japan Visa last week and got approved fairly quickly (yay!) so I thought of sharing with you the step by step in applying for a Japan Visa so you don't have to go back and forth, trying to complete the documents on the day of filing like I did the first time I applied! Japan, one of the first world countries of Asia, is a wonderful city to visit as it is a melting pot of the past and future; it is interesting and inspiring to see how the Japanese continue to innovate without losing connection to their tradition. And if you are a lover of makeup and skin care products, as well as art supplies, Japan is the best country to visit! Lover of theme parks and anime/manga? Japan offers Tokyo Disney Sea, Tokyo Disneyland, Sanrio Puroland, and Pokemon Center. Love food? There's Tsukiji, the famed crepe stands and boutiques of Takeshita, and the innovative Ramen vending machines. Looking to score gadgets at a fairly affordable price? Pass by Akihabara Electric Town. History, nature, shopping, gadget, and food lovers alike will find something to love in the land of the rising sun. But to get there, one must secure a visa if your country is required by the Japanese government to have one prior to entering their country; the Philippines is one and here's a step-by-step guide plus tips in applying for a Japan visa. STEP 1: Have your visa processed by a travel agency; avoid fixers because you might end up spending more or losing money. Look for a travel agency to process your visa. There are two kinds of local travel agencies that process Japan visa: 1. AUTHORIZED 2. ACCREDITED. Authorized agencies charge a bit cheaper and the processing period is 7-10 days and Accredited agencies charge a bit higher and the processing period is 5-7 days. The most popular agency in Manila that processes Japan Visa is Friendship Tours located at the 3rd fl. of Dusit Thani Hotel, Makati City (visit their website HERE). Friendship Tours charges P1,200.00 for Japan Visa, Tourist, single entry processing. L-R: Japan Visa Application form, Schedule of Stay, Certificate of Employment, Bank Certificate, and Income Tax Return or ITR (not in photo). No need for Birth Certificate for me because I am reapplying. STEP 2: Prepare the following documents and things. - Latest and original copy of your birth certificate. Request from NSO. **Other supporting documents: Marriage Certificate, SEC Business Registration (if you have a business), Baptismal Certificate, School Records, and Certificate of Non-Record (in the absence of a Birth Certificate or if said document is unreadable). Please confirm with your preferred agency for other additional documents I may have missed. If you are reapplying, prepare the following main documents. **No need to produce a birth certificate if you are reapplying. Make sure that all your documents are not older than 3 months and you have them on hand as they are non-negotiables. For IDs, they should be nowhere near expiration. If you have issues with the other documents and for some reason, they cannot be obtained, contact your preferred travel agency for assistance. STEP 3: File all your documents in your preferred agency. I really recommend Friendship Tours because they are very systematic, professional, and fast. STEP 4: Wait for your agency to call you regarding the status of your application. Good luck! Yay! My application was approved in just 2 days! Here's what a Japan tourist Visa looks like. 1. Prepare all your documents beforehand; be sure to produce all the main documents and keep around two supporting documents as back up just in case the Consul asks for more documents (it happens!). 2. The Japanese Embassy recommends that you should not purchase plane tickets and book hotel rooms before your application is approved; these won't have any bearing on your application and won't be vital for reconsideration by the Consul if your application is denied. 3. For your Bank Certificate, show a balance that you think will be more than enough to support you in your stay; you have to make the Consul see that you have enough money to help yourself or even send yourself back home just in case something happens. It doesn't have to be a million pesos; it just has to be enough. 4. Even if your preferred travel agency promises to process your application in 7,6,5,4,3,2 days or even one day, don't be complacent; file at least a month before leaving so you have enough time to adjust and produce additional documents if needed. 5. Don't fake your documents! You might end up being banned! WHAT IS A MULTIPLE ENTRY VISA? HOW DO I GET THAT? - Multiple Entry Visa is a tourist Visa that has longer validity; at Friendship Tours, processing of Multiple Entry Visa is P2,000.00 (price of Friendship Tours) and will require a request letter to the Consul (meaning you have to write it yourself and explain to the Consul why you are requesting for it.). In some cases, there are single entry applicants who get issued by this type of Visa right away, depending on factors and standards by the Consul. I AM STAYING WITH A RELATIVE IN JAPAN. ANY SPECIFIC DOCUMENTS NEEDED FOR THIS? Once you secure all these documents, file them together with the Tourist Visa application requirements. Please visit HERE for more details. Hope this helps! By the way, looks like the folks at the embassy are pretty lenient with Filipino travelers right now; maybe because a lot of Filipinos have been visiting Japan lately for leisure so there's no better time to visit Japan than now because you will more or less have a breezy experience when applying for a visa! P.S. I am not paid by Friendship Tours for this blog post; I am just a happy customer of theirs! Thanks for the tips, Ms. Martha. I would love to go to Japan in the near future! Oh my! This is really helpful. I wanted to go to Japan as well, it's a my dream as a kid but now, I have more reasons as I wanted to be with my boyfriend working there. Haaay. Hoping to visit really soon, in God's time. Ugh I want to see the cherry blossoms and hoard collagen drinks from them. Sama ako Ms. Martha! would love to visit Disneyland, Harry Potter world and Sanrio.. have fun!! waiting for your Japan haul. What if I already booked before applying for visa? Hi! That's okay, but then again, it won't guarantee the approval of your application. I did that for my second trip too, but I got approved. Just produce all the documents needed; good luck! Thanks for sharing this! This is SO helpful! thanks for the heads up Martha! Japan is one of my bucket list, Tokyo, Osaka, narita. Enjoy your trip! This is very helpful Ms. Martha, i am planning to go to Japan soon with my friend, hoping to have a smooth visa application also. I am thinking of not getting a visa agent for my application and just apply for it myself, of course for the reason of saving money. Hmm do you think it is a good move and will I still be approved even I do not have any visa agent? Hi thanks for sharing this! I just wanna ask if what they are preffered for the bank certificate from a couple? The reason is our show money is under my bank account's name but my husband is the one working.thanks for ur response. Not so sure about this, but I think even if the money is yours, you still have to show that there's a reason for you to go back to the Philippines (aka work). Are you working or staying at home? You can provide an explanatory letter for that, I believe; kindly ask your preferred agency for other options. Good luck! Hi, is it okay to apply for a visa in January even if you plan to go in July? My husband wanted to come early as soon as possible. Like my status is married but I'm applying tourist vissa for entering Japan. Is not question able from the Japan embassy? Hi, depends on your length of stay, I think it's safe to have at least 6 digits in your bank account. Or if less, 70k is a good starting point. If you are visiting your cousin and will stay with them for a while, you must fulfill the required documents for visiting relatives in Japan. Please read the bottom part of the post. Hi, I believe you must fulfill the required documents for visiting relatives in Japan. Please read the bottom part of the post. State also that you are a student and you may need to provide supporting documents for this. It is OK for me to apply tourist vissa? Is there is no quetionable.from Japan embassy why for long time I did not apply for this? Am I need a invitation letter from my husband ? Kindly please help me to know your advise what am I doing to do? Since from 2001 until this year's we didn't see each other. But he continue of monthly of support ong me until now. Gusto ng asawa ko na Mag apply daw ng tourist papuntang Japan. At pagdating doon. At soon ko nalang asikasuhin ang mga papeles ko. Hindi kaya ako na question? Hi, I think you have to fix your documents and fulfill all requirements here before leaving. Hi, I can't really say, but 50k for 4 days looks good. Suppose one day in Japan requires you to spend at least 4-5k excluding lodging fees, then 50k should be enough with at least 20-30k buffer money. But then again, this is just my opinion. The embassy still has the final word. But if you're going to ask me, I still advise applicants to have at least 70k and up as balance when applying for a visa. hi, i applied visa yesterday, i have 50k on my bank account, i submitted also my COE, leave form, my contract of service and my 2306 and explanation letter for not having 2316, 4 days in okinawa japan, do you think maaaprove po visa ko? thanks po. My other friend was issued with multiple visa the third time around. I'm going back this year for a vacation and I hope to get a multiple this time! I hope you get yours! No need to submit NSo if reapply? even your first application was denied? What do u mean po here? Thanks! If you are reapplying, no need to submit a birth certificate provided that you have been approved prior, I believe. Hi! We're going to apply for japan tourist visa as a group (me and my fiance's family). Each employed member must submit a bank cert right? And in my case kasi, my account balance is way below the 'safe' range. Is it alright to declare a guarantor? - which will be my fiance. Thanks for the reply! I got my japan visa valid may 10 to august 10 it is okay to go to japan on august 9 and stay there for 2 weeks? i got 15 days to stay in japan. 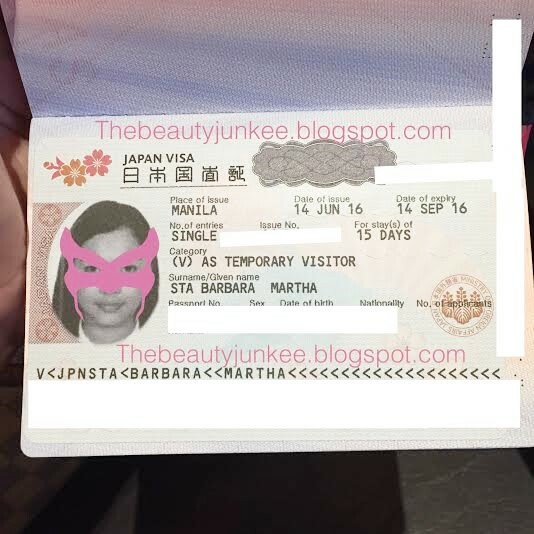 Dear Ms. Martha, I enjoyed reading your blod on how to apply for a Japanese visa, anyway, as much as I would like to go to Japan... do you have any idea about the requirements if your applying to the agency as an OFW? (as I was told that applying for a visa in the philippines will have a much better approval rate) as I dont want to risk getting a denied visa as it'll take me another 6 months before reapplying... I really wanted/needed to go to Japan! Enjoying reading your blog Ms. Martha! Very concise and well detailed. Anyway, I plan on applying my visa 2 mos from now, does it require personal appearance for a first timer ? Thanks for sharing the really nice information .